In a nutshell, Kubernetes is a container orchestration tool that enables container management at scale. Kubernetes isn’t a replacement for Docker. However, Kubernetes is a replacement for some of the higher-level technologies that have emerged around Docker (i.e Docker Swarm). 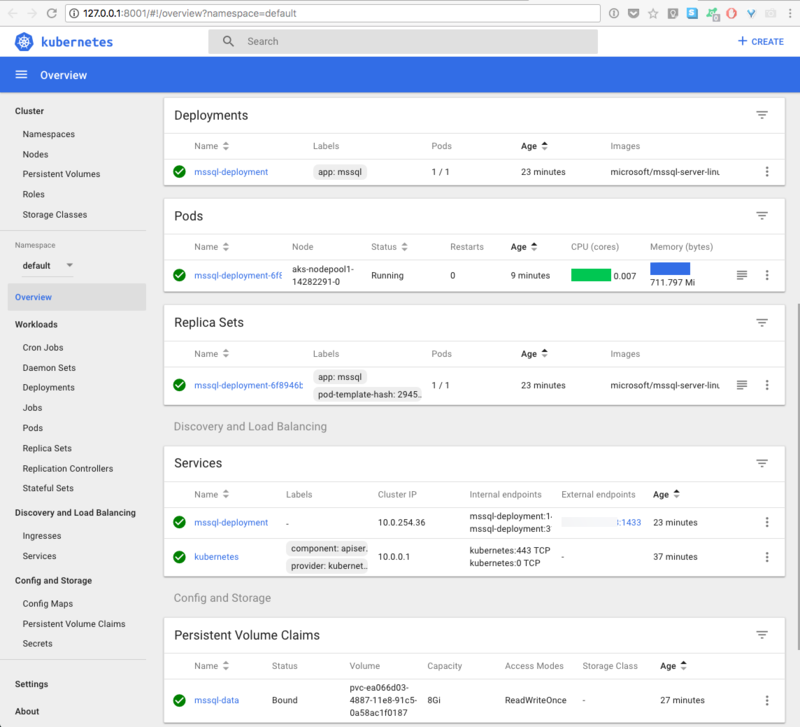 To learn more about Kubernetes, check out this Getting Started Guide. Enters Azure Container Service (AKS) which manages your hosted Kubernetes environment, making it quick and easy to deploy and manage containerized applications without container orchestration expertise. It also eliminates the burden of ongoing operations and maintenance by provisioning, upgrading, and scaling resources on demand, without taking your applications offline. [Important]: Azure Container Service is currently in preview – Some aspects of this feature may change prior to general availability (GA). This post will demonstrate how to configure a SQL Server instance on Kubernetes in Azure Container Services (AKS) with persistent storage for high availability. The outcome provides resiliency against SQL Server pod failure or cluster node failure. Kubernetes 1.6+ has support for Storage Classes , Persistent Volume Claims , and the Azure disk volume type. You can create and manage your SQL Server instances natively in Kubernetes. The following will walk you through creating a deployment to achieve a high availability configuration similar to shared disk failover cluster instance. In this configuration, Kubernetes plays the role of the cluster orchestrator. When a SQL Server instance in a container fails, the orchestrator bootstraps another instance of the container that attaches to the same persistent storage. First thing, you will need an Azure subscription with enough credits to provision the Kubernetes cluster (4 VMs). While AKS is in preview, creating new clusters requires a feature flag on your subscription. You may request this feature for any number of subscriptions that you would like to use. Use the az provider register command to register the AKS provider. After registering, you are now ready to create a Kubernetes cluster with AKS. Expect to take a couple of minutes to bootstrap the cluster. The command will return once bootstrapping is complete. You should see that our newly created cluster with 3 nodes and a status of Ready. We will now create a password in the Kubernetes cluster. Kubernetes can manage sensitive configuration information like passwords as secrets. The following command creates a secret that holds the value for the password that will be using for the SQL Server SA account. Replace YourComplexPassword with a complex password. kubectl create secret generic mssql --from-literal=SA_PASSWORD="<em>YourComplexPassword</em>"
Create a manifest to define the storage class and the persistent volume claim. The manifest specifies the storage provisioner, parameters, and the reclaim policy. The Kubernetes cluster uses this manifest to create the persistent storage. The following yaml example defines a storage class and persistent volume claim. The storage class provisioner is azure-disk because this Kubernetes cluster is in Azure. The storage account type is Standard_LRS. The persistent volume claim is named mssql-data. The persistent volume claim metadata includes an annotation connecting it back to the storage class. The container hosting the SQL Server instance is described as a Kubernetes deployment object. The deployment creates a replica set. The replica set creates the pod. In this step, create a manifest to describe the container based on the SQL Server mssql-server-linux Docker image. The manifest references the mssql-server persistent volume claim, and the mssql secret that you already applied to the Kubernetes cluster. The manifest also describes a service. This service is a load balancer. The load balancer guarantees that the IP address persists after SQL Server instance is recovered. Because I just issued the command right after creating the deployment, it is showing that the container is being created… leave it some time to pull the docker image and try again. It should then show a status of Running. Take note of the EXTERNAL-IP, that’s the one will be using to connect to the SQL Server instance. sqlcmd -S <em><External IP Address></em> -U sa -P "<em>YourComplexPassword</em>"
It worked! Notice the pod name before and after the delete, it is different and running on a different node. You could then use kubectl get pods -o wide to verify that a new pod is now deployed and running and use kubectl get services to verify that you have the same EXTERNAL-IP address for the new container. Hence also try to reconnect to the SQL Server instance (with same ip) and voilà! That’s it. We just walkthrough on how to configure SQL Server containers to a Kubernetes cluster for high availability in Azure Container Services (AKS).